This year my husband Mark and I spent a wonderful Valentine’s Day weekend in L.A. and Palm Springs. We talked about the possibility of retiring in the area, since we both prefer much hotter weather than we are getting in Seattle. 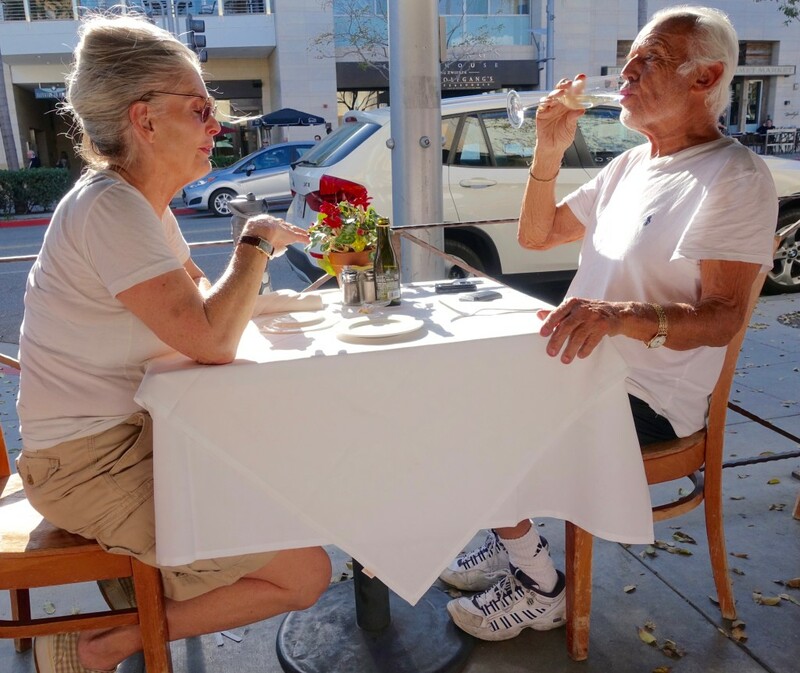 On our first day, we shared the most amazing chopped salad at a restaurant with seating on a Beverly Hills sidewalk. At a table adjacent to us were a mature man and woman whose vitality attracted a fair share of my atttention. I overheard the woman mention being “on stage” and figured she was a show business veteran; at one point, Mel Brooks was walking nearby, and she rushed over to greet him. The still-piercing blue eyes of the man at the table led me to imagine him in several movies. Thanks to these two, I shed some of my concerns that day about aging. And I set an ideal for how Mark and I will be in those retirement years: relaxed, healthy, and enjoying life. I can’t identify the couple, but it reminded me of an image that often crosses my mind when I think about growing old. Several years ago you and I were at the Legion of Honor in San Francisco and there was this elderly couple that had set up a picnic on the grounds. Do you remember? They had a complete set up – folding table, tablecloth, place settings, and a perfect view of the water. She was bundled up in blankets and he was serving her. It was such a beautiful and loving scene, and I recall that we were so taken with them and wanted to know their story.